We're almost finished patterning. Unlike the separate back facing piece I'll be patterning the front facing on a fold. The corset used to make the post Edwardian pattern is cut this way. The openings for the loops are slits cut in the fabric so that's what we'll be doing when the time comes. Place the front pattern piece on a piece of paper and draw a line along the center front, then draft a parallel line 1 1/2 inches from the center front. Flip the pattern piece over with the center front still on the center front line and trace the top and bottom edges. Lift the front pattern piece and draft a line 3/8 from the outside line. In the picture below the top line is the center front, the bottom/outside line is 1 1/2 inches from it, and the edge of the ruler is 3/8 up from the bottom/outside. Tape the front piece on the center front line and cut out the facing. It should look like this. Fold the facing piece over on the center front, then fold the 3/8 inch section back. Like this. Flip everything over and trim the excess from the top and bottom edges. Put a notch at the top of the center front. The finished piece should look similar to this. Here is how it will work when the fabric is sewn. You can see how it's the same as the original post Edwardian. That's it! The patterns are done! If you are still fitting your mock-up you have a few days to catch up before we cut the fabric and begin sewing. 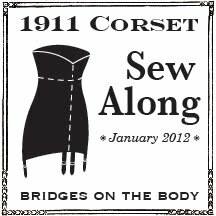 I'm so looking forward to seeing everyone's corset come together! 1911 - the last work on the pattern, really.